President Barack Obama has officially nominated Wilma B. Liebman to be the new chair of the National Labor Relations Board, marking an important policy change. While a member of the NLRB, Liebman has openly disagreed with the Bush Administration on labor-management relations. Thus, her appointment is one more indication that employers will face a different world under the Obama Administration. The NLRB is an openly political entity. The usual split among the five-member Board provides three members of the President's party and two members of the other party. The chair is usually from the President's party, and the Board’s legal positions change as the composition of the Board changes. Although political considerations are not supposed to matter at the adjudicative level, there is no other explanation for the reversals of Board precedent observed over many years. 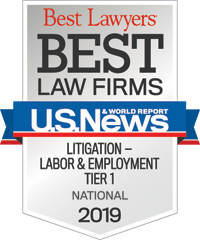 Liebman was initially appointed to the Board in 1997 by President William Jefferson Clinton, and her career experience includes service as counsel to the Bricklayers and Allied Craftsmen Union and the International Brotherhood of Teamsters. In a speech last summer, Liebman said she disagreed with the focus of the Board under President George W. Bush, which she perceived as trying to maximize employee freedom to engage (or not engage) in union activity. She said she believed the proper focus of the Board should be to promote union organizing and union activity generally. She further said she believed current law was significantly slanted in favor of management and should be changed. Finally, she did not come right out and say so, but it was clear from her remarks, as well as previously published testimony before Congressional committees, that she strongly supports the so-called Employee Free Choice Act. Our attorneys have been advised by staff members of prominent U.S. Senators that nominations to the Board by the Obama Administration may not follow the traditional three-two split. Instead, we have been told to expect nominations of candidates from the union side only. Obama’s selection of Hilda Solis to be Secretary of Labor provides some support for this expectation. Solis consistently has been strongly supportive of the EFCA and unions in general, and her selection has been greeted with open rejoicing among union leadership. Although we don't know what will happen with the EFCA, we do know that the Lilly Ledbetter Fair Pay Act, which would reverse Supreme Court precedent concerning the statute of limitations in Title VII cases in which allegedly discriminatory decisions affect pay, has passed the House and Senate. We expect the President to sign the legislation into law immediately upon final approval in the House. This will be only the first in a long line of anticipated changes generally favoring employee individual rights and labor unions. For almost 20 years, union organizing activity has been minimal, with certain industry exceptions. Meanwhile, individual employee rights have gradually expanded at the federal, state and local levels. This year, we expect to see a rapid expansion of laws protecting individual employee rights and encouraging union organizing. While employers are grappling with the horrific fallout of the global recession and seizure of the credit markets, unions and employee rights advocates will push for a playing field that favors their causes. Employers need to be especially concerned about employee relations generally and management training during these most trying times. One school of thought says employees won't be interested in unions when they read about people being laid off all over the country. Another says this is exactly the kind of environment in which employees will believe anyone who promises any kind of job security. The balance of legal power between employers, unions and individual employees has already begun to shift dramatically. We expect to see much more. Contact your Constangy attorney with questions or suggestions.